The situation in Khartoum and across Sudan remains fragile, and can change rapidly, following an announcement on 11 April that President Bashir had been replaced by a military council. These political developments occurred following an extended period of protests across Sudan, which began in December 2018 and intensified significantly at the start of April. In Khartoum, protests have especially focused around the area to the north of the airport, though Khartoum 2, Amarat, Bahri, Omdurman Burri, Haj Yousif and Souq Al-Arabi have also seen regular protests and security operations. Demonstrations have occurred sporadically, particularly following Friday prayers. Live ammunition and tear gas have been used against protestors and shot into the air in celebration. A nightly curfew in Khartoum has now been lifted, but a state of emergency remains in effect, which gives security forces increased powers of search, arrest and detention. You should continue to follow the instructions of the local authorities and security services. There are sporadic limitations on access to internet-based communications and social media sites without the use of Virtual Private Networks (VPNs), which are not readily available to download in Sudan. 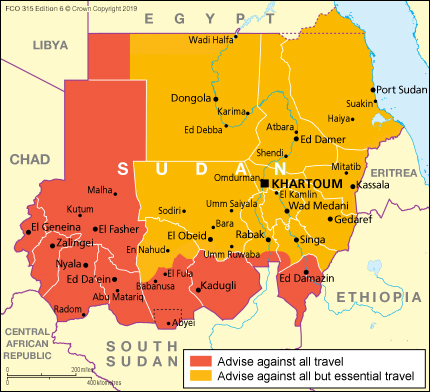 If you’re in Sudan or planning essential travel, you should maintain a high level of vigilance, monitor developments closely, avoid all protests or large gatherings, limit movements outside of your accommodation and follow the instructions of local authorities, including adhering to any local curfews. The ability of the British Embassy to provide consular support to British nationals in Sudan is severely limited. You shouldn’t assume that the FCO will be able to provide assistance to leave the country in the event of serious unrest, a further deterioration in the security situation and/or reduced capacity of commercial flights. See this page for more information about the precautions you should take in the event of a crisis and the help and support the British Embassy can provide. On a number of occasions since the beginning of 2018, there have been shortages of fuel throughout Sudan including in Khartoum. At times these have led to very long queues (several hours or even overnight) at petrol stations (which regularly run dry) and rationing of the commercial supply. Earlier in the year, the shortages had knock on effects, including availability of services and some basic food items. There have been some violent incidents at petrol stations. If you need to travel by road, consider how you will get fuel during your journey and whether you have sufficient fuel for your return trip.